Forcing the Komen reversal was huge—but it was a campaign born of outrage, not ambitious vision. When the Susan G. Komen Foundation, under pressure from the Christian right, tried to slip quietly out of its commitment to fund breast screenings for low-income women through Planned Parenthood, it inadvertently roused the slumbering pro-choice giant—made up of the millions of American women who would like to keep control over their bodies. The giant rubbed its eyes and roared, “You did what?” and Komen cowered. Facing a barrage of criticism conveyed mostly through social media networks like Facebook, Twitter and Tumblr, the foundation abruptly reversed itself and offered a qualified apology. Karen Handel, the Republican Komen official widely viewed as the internal force behind the change, resigned. The episode was a powerful reminder that women are not willing to sit by as their rights are taken away by a hyper-organized band of religious extremists who pressure and intimidate allegedly neutral institutions like Komen. It made clear that anti-choicers aren’t the only ones who can throw their weight around. And it enabled Planned Parenthood to collect $3 million to support its vital mission. But the Komen reversal, like the defeat of Mississippi’s Fetal Personhood Amendment this past fall, while sweet, was ultimately a defensive victory. 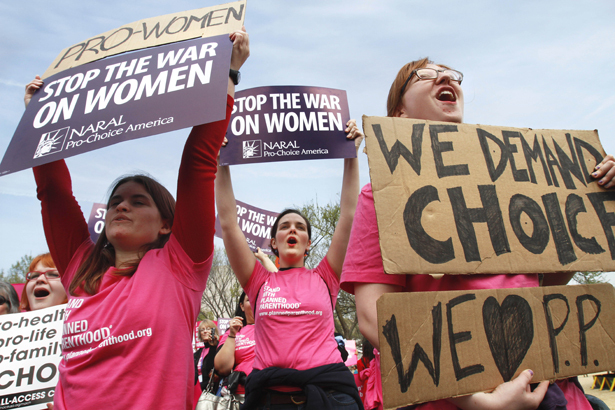 The campaign succeeded not in advancing reproductive healthcare but in preventing a loss of such services. It was fueled not by an ambitious vision but by outrage—at the fact that a huge mainstream organization like Komen would in effect ally itself with a figure like Representative Cliff Stearns, the Florida Republican who, after his crusade to defund Planned Parenthood failed, launched the “investigation” that placed the organization in Komen’s cross hairs. Stearns’s inquiry has forced Planned Parenthood to come up with years of records to document its adherence to the strict separation of funds mandated by the Hyde Amendment, which has made it harder for poor women to obtain abortions ever since it banned federal funding for the procedure in 1976. No one outside feminist health listservs even questions the Hyde Amendment anymore. After President Obama enshrined the principle of Hyde in his landmark healthcare law in 2009—the price he had to pay for the support of anti-choice Democrats—women’s rights groups tried to jump-start a campaign to repeal Hyde; but they haven’t managed to do more than lob a few petitions in Congress’s direction. Notwithstanding the impressive power of online feminists on display in the Komen fight, pro-choicers lack the votes in Congress to make advances. According to NARAL, staunch anti-choicers outnumber pro-choicers 46-40 in the Senate; in the House, the split favors anti-choicers 246-155. In many state legislatures the picture is similarly bleak, paving the way for legislation like the anti-choice bill that passed the Virginia legislature while the Komen furor raged; it requires that women seeking abortions undergo an ultrasound and be offered the chance to view the image or listen to the fetal heartbeat before proceeding. After Republicans swept into Congress in 2010 promising to focus on the nation’s economic health, they turned around and focused instead on women’s health—undermining it, that is. Pro-choicers have fought furiously, with some success, to block their attempts to roll back hard-won rights. If the grassroots energy that brought Komen in line can work similar magic on Congress—by electing pro-choice candidates and keeping up the pressure after the election—then real progress might actually be possible.